My Mimi told me I had to frame this picture (turned out to be one of favorites from our day in Williamsburg). What do you call your grands? What are you fave traditions when visiting fam? Thomas’s dream was (and is) to fly. I didn’t know how I felt about it, all of the fears arose, I had too many questions to ask at once. But, I just knew that he lit up when he saw airplane pass by, it often occupied our supper conversation and I didn’t want to be the one to hold him back. Ask God the hard questions! Boos cruise! This might be my new favorite way to spend Thanksgiving! Cabana oooh nah nah ✨ Would it even be a beach trip without straw accessories, though? This weekend was full of apple butter, crossword puzzles, shopping, wine sipping, historic fact sharing and story telling and I wouldn’t trade it for the world. I wish everyone could meet my Uncle Jim. I’ve actually written a blog post before on my trips to Roanoke and my favorite stops along the way. Feel free to read that here! A few weeks ago, I got to visit Portland, OR and man! I had a blast! It was the funkiest and quirkiest little place but I'll never forget how much fun we had and all of the new food, the new ice cream flavors and sights I got to see. I highly recommend Portland if you find yourself in the Pacific Northwest. We ate our way around, had about 6 meals a day, but now I know my favorites and I can't wait to share them with you! The sweetest and most simple coffee shop around town, Tea Bar, serves only tea. If you're in the mood for a sweet pick me up without the espresso, this is your spot. Craving Mexican? Look no further! ¿Por Que No? serves the greatest taco combinations, burrito bowls and the most delicious margaritas (in a small and big pint size), add fruit juice to your margarita and you're set (I added mango, yum!). It's the fun, walk in to a tiny restaurant, pray there's seating inside or outside, grab your number and they bring it to you type of restaurant. 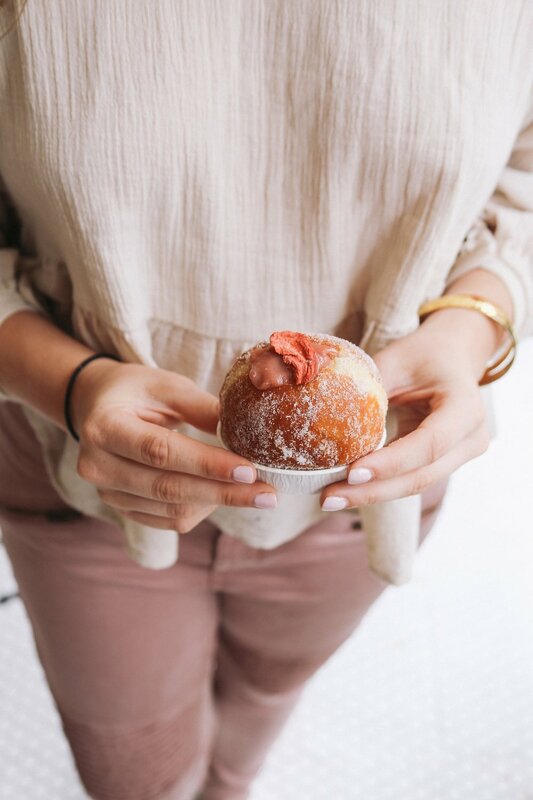 You can find this donut shop at 6 different locations around Portland. You can check out all of the different flavors here. Must, must, must visit! This sweet treat destination has the most interesting flavors of ice cream! Lavender vanilla, olive oil (actually so scrumptious), Black Olive Brittle & Goat Cheese, Double Fold Vanilla, Roasted Strawberry Coconut and more! Don't be frightened to ask for multiple flavor samples. If you didn't try at least 8, you didn't do it right. Pro tip: you can combine flavors, too! With 3 different locations all around Portland, you can't miss it! Pip's serves smaller sugared donuts with fresh brewed coffee. Get there early, there can be a longer line but if you catch it at a busy time, no sweat, they move quickly! This Australian cuisine is one that takes American food and gives it a small twist. 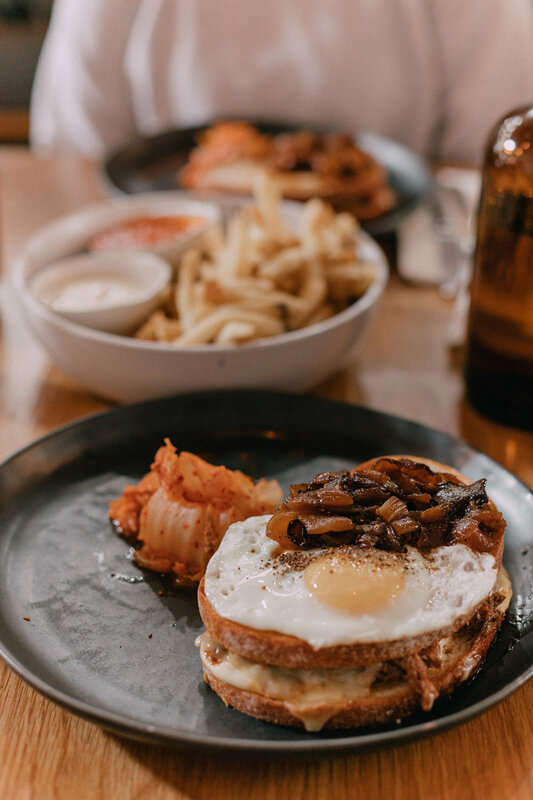 They're fried egg sandwich makes the perfect brunch with a cup of Australian coffee and freshly squeezed orange juice, you're all set for a different type of brunch, a West Coast brunch. This short little trip from the heart of Portland will fulfill all of your adventurous desires. It's only a 5 minute walk/hike from the parking lot right off of the highway. The breathtaking view can't be missed if you find yourself in Portland. You can make it as quick or as long as a trip as you'd like. If it's chilly, make sure to grab a cup of coffee or a treat from their information center - it's easy to make this stop a cozy one. If you're desiring to get your heart racing a bit or just want to take a load off of your feet, grab a Nike bike from one of the many bicycle stations around Portland. Using the Biketown app, you can "check in" and "check out" a bike at any destination you please. You don't even have to return it to the same station you picked it up from - brilliant! If you've thought/heard of Portland you've probably heard of Powell's. It's the largest bookstore with plenty of levels and groups of literature. Wanting to know more about a specific subject? There's a corner for you at Powell's. From best-selling, antiques, non-fiction to coffee table books, they have it all! If you want a trinket to take home while supporting local Portland businesses, you'll love Made Here PDX. Leather, perfume, blankets, shirt, coffee mugs and more, it's not your average gift shop! The most beautiful nursery I've ever stepped foot in. The colors and greenery will leave you speechless with it's Parisian vibes and eclectic pot holders. You can find just about anything for your home here. Or, just stop and stare at the beautiful tiled floor, glance at the multitude of plant species, or just take a picture. Worth it! Portland was the cutest, spunkiest, quirkiest (without being weird) town I've every enjoyed! A "must-go" if you find yourself in the Pacific North West. Where's your favorite place to visit in the PNW? Before heading out to California for the summer, Thomas and I wanted to take advantage of all of the southern cultures we could get. Where better to soak in the low country tastes, smells, and accents than Charleston, South Carolina. Growing up in Columbia, SC, Charleston was only a quick drive away so we frequently visited to get our "beach fix." Whether it was shopping on King Street, enjoying the super fresh seafood or lounging on the beach, I always looked forward to it and didn't mind the drive. Now, being married and loving adventure, we were up to the travel from Alabama to enjoy a sweet 48 hours in a place we love. If you want a true taste of the South, run (don't walk) to Poogan's Porch! They have shrimp and grits, chicken and waffles, pimento cheese balls (highly suggest) and all the southern dishes you need to taste before leaving! If seating is open outside and weather permits, choose to be seated on the porch. You'll get an incredible view of the charming side streets of Charleston. Just like mama's cooking (but better). Before the meal, when serving drinks, they'll bring you all-you-can-eat boiled peanuts. Get the biscuits with the housemade jam as a snack! They have fresh specials every day and a dessert menu you can't resist. It's about a 4-minute walk to the battery so you can walk off your lunch and enjoy the scenic southern mansions. Happy Hour | Restoration Hotel rooftop bar, "The Watch"
A great location to sit back, soak up the sun and enjoy a few drinks and snacks! We chose to sip on the Romero's Bad Habit and The Ghost of Strawberry Church - both very yummy. For snacks, we nibbled on the Takeout Wings, House Truffle Frites (fries) and on the Ham and Cheddar Hushpuppies. By far our favorite dining experience! Everyone was so kind and so eager to serve us! We were greeted first thing when walking in the door and were advised to sit at the bar or the community table for faster service. The community table is a larger table seating several parties but is a great idea if there's a long wait. Don't limit the bartenders to the cocktail menu because they are so so talented and can whip up anything you're in the mood for. While we were there, we enjoyed the tuna tartare (ah-mazing), the ceviche (so good if you wanted to branch out and try a unique seafood dish), and crab cakes (their crab cakes are the best I've ever tried). We finished off the night with a slice of key lime pie. Side note: I don't normally care for key lime pie, but this pie was delicious and I'd order it again! 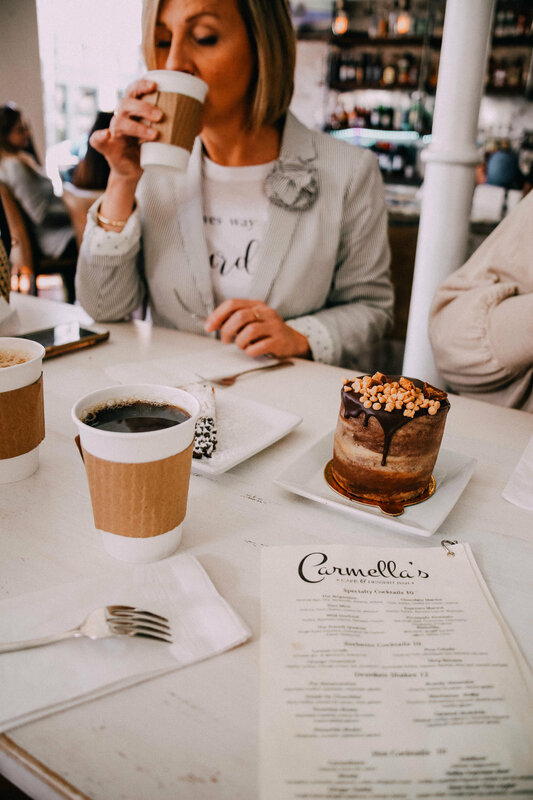 If you need a quick pick-me-up snack or you're in the mood for something sweet late at night, Carmella's is your place! Located near the Market, you can find a quick cup of coffee, a fun dessert cocktail or choose a dessert from their sweet display of personal cakes (to share, of course). If you're wanting to do something different and maybe take a break from the heat of walking the streets, this is a great option! Whether it's with a special someone as a date or a group of gals, it's a blast! This was so so fun, super educational but also walked away with 4 candles! Basically, a candle pourer from Candlefish walks you through the process and chemistry of candle-making, you get to sniff tons of scents and create your own candles with the favorite you found. You pour your own oil, wax label your own glass and fix your wick. From start to finish, it's hands on! If you're wanting to go to the beach but don't want it to be super crowded, I suggest heading to Isle of Palms Park. Once you pay the tenant for parking, you can unload your beach gear and head over the dunes to the beach. There are public restrooms, changing rooms and showers to clean off before heading to supper. Shopping, shopping, galore. From smaller, local boutiques to larger, more well-known shops, you can find anything you're looking for! Parking is tough, s try and find parallel parking on a side street. If you're wanting to see some traditional and beautiful Charleston homes, head to the Battery and wander around the cobblestone streets. You'll be in awe of all of the vintage door knockers, colorful houses and porches, greenery and ivy, and fire lanterns. If you wanted a "treat yourself" afternoon, this is a fabulous option. They have a lengthy menu of services that they provide from pedicures and manicures to massages. The service is incredible and you won't find a better spa in Charleston. This is a fun place to take a group of girlfriends or a bachelorette party. Mylkbar uses only non-toxic products (love that) but more than that, their interior beats any other nail salon in Charleston. With cute and flirty decor, you'll experience the most pampering pedicure with rose and the most hilarious staff. They'll keep you laughing the whole time. My family has a condo in Charleston so we're able to use their space when we come to stay but plenty of spaces around us are also up for rent! Try an Airbnb or Vacation Rentals before booking a hotel. For several reasons: 1. The cost will be cheaper 2. You'll be closer to water 3. More space. We can't express what Charleston means to us and we can't wait to visit again! What are your favorite places in Charleston? Where do you look forward to visiting? Please share! I'd love to hear your thoughts! Thank you to Candlefish, The Restoration Hotel and Hanks Seafood for their experiences and sponsorship of this post. All opinions are my own. It's no secret that Birmingham is a foodie's dream location. I say that you could eat every meal at a different location for an entire year and still not discover all of the yummy restaurants and foods around this beautiful place I call "home." As good as breakfasts, lunches and dinners are I'm all about sweet treats and desserts. I have a sweet tooth like it's no one's business! These are 6 of my all-time FAVORITE places in Birmingham that you cannot miss if you live here or skip out on if you're visiting! They top if off with a scoop of ice-cream (melts quickly) and chocolate syrup! 😋 Ask for several spoons and split it with your table. If you're on a gluten free, dairy free or any special type of diet, this is a must. Farm Bowl is right next door to Urban Cookhouse and cannot be missed! They serve açaí bowls, oatmeal bowls, juices and smoothies. Wow, wow, wow. Pick up a juice or kombucha while you're at it! Don't forget to walk outside, swing on their swings and take a picture in front of their mural. Stay a while! You must take a picture with the Vulcan mural in each store! Ask the friends behind the counter what their favorite flavor is - they'll never steer you wrong. My favorite is the Healthy Peanut Butter, The Presidential and the Second Date. Don't feel like splurging that much? That's okay! They have a Superfoods Healthy Peanut Butter: "Sister to the Healthy Peanut Butter Cookie, the Superfoods Healthy Peanut butter contains chia seeds, flax seeds, walnuts, and dark chocolate. It contains coconut oil instead of butter." Check the chalkboard outside for their flavors of the day, it's always changing! Catch them on a good day and you'll find brownies and cookie sandwiches! Definitely Instagrammable! Take a picture in front of their white painted shop, inside with the neon light, wherever! Hero Doughnuts was recently renovated from an old car shoppe into a doughnut shoppe and I am not complaining! On a good day, if the weather permits, they'll open up the garage door and let the fresh air + breeze in - love that! Pro tip: if you go in the afternoon it's "happy hour" and doughnuts are half-off BUT be careful and don't go too late because they close when they sell out of donuts for the day. 🍩 If you do happen to catch them on your trip, make sure to get the "sidekicks" (aka doughnut holes) they're the best little bite sized things I've ever tasted. Dunk them in some coffee and you've got yourself a treat! If you're a little more hungry for something than just a small snack, ask for their burger - so good! What are your Birmingham favorites? I'd love to know!! I've got to branch out and try new things! The sweetest bakeshop, super small so the line goes out of the door, but so so worth it on your trip. It may be out of your way but the yummy cruffins and donuts make up for the detour! Every part of this store is creative and makes for a great photo op! If you love Mexican, this is for you! Their pomegranate margarita was so perfect after a long day of walking around San Fran. Ask for outdoor seating to be seated on the side of the pier at Pier 39 - Fishermans Wharf - that gets a great view of ships coming in and out and all of the sailboats on display! Bring a jacket, it gets a little chilly on the water. If you're like me and you love donuts - everyone know's this about me - then you'll really appreciate this "hole in the wall" restaurant. This sweet little shop is run by an Asian family who makes the donuts in front of your face and serves them until their gone. They're also known for their giant, bigger than your face, donuts. Their old fashioned are my favorite. If you like donuts and San Fran, this place is for you. When going to Chinatown, it's good to get a feel of authentic Chinese food, but not too authentic if you know what I mean. Thomas and I are adventurous but not to the point we'll try something that we just don't know exactly what it is. So, Xian House of Dumplings was perfect! They had an authentic menu, an authentic feel but also served your regular chicken fried rice, chow mein, dumplings and wonton soup. Known for their appearance in the opening intro of our favorite TV show, Full House, the Painted Ladies are known for the Victorian colorful look. Across the street is a park that's great to grab some lunch at the nearest grocery store and throw yourself a picnic. The Famous Gold Gate Bridge cannot be missed. Of course, there's plenty of places to go in order to leave with your perfect picture. We chose to look at the bridge at Kirby Cove Campground. There's a beautiful road, often with cyclists climbing the hills, that you can drive up. Along the side of the road, there are parking spots for visitors to take pictures! Make sure, if it's a foggy day, to tag @carlthefog on Instagram in your foggy picture! If you love shopping, this area is for you! There's every store and every department store you could think of within a few blocks of one another. Try and find a parking garage and then walk around where ever you're planning to go - you won't find parking anywehre else than garages. This is the famous station that has trolleys running up and down San Fran streets. You may have seen these featured in "The Princess Diaries" when Mia accidentally runs in to one on the street. This was the perfect place to round up our day. It has tons of fun stores, a carousel, any restaurant to fix any craving, and it's on the water. You may want to take a jacket because it gets chilly the closer to the water that you get. There's a market around several corners, too, to pick up some fresh fruit to eat while you stroll through the crowds. Not only is this a neighborhood full of tall Victorian houses on the side of steep streets but it's also home to boutiques and other walk-in shops, cafes and the very new LiketoKnow.it mural right around one of it's corners. We stopped and took some pictures, of course. This is a great place to roam around if you have a few extra hours but I would not recommend it as an absolute "go-to" during your time in San Fran. It's proximity to other must-see places is what makes it worth seeing. The streets are strung with Chinese lanterns that are said to glow at night, dozens of Chinese restaurants and tacky, but fun, San Fran tourist shops with the "I love San Francisco" tees and kimonos. We stayed on Nob Hill (right next to Chinatown) in the Ritz Carlton. It's proximity to other locations was great. They accommodated us well - we told them that we were celebrating our one year anniversary so they treated us to a complimentary bottle champagne. There are great places close to the city on Air Bnb! 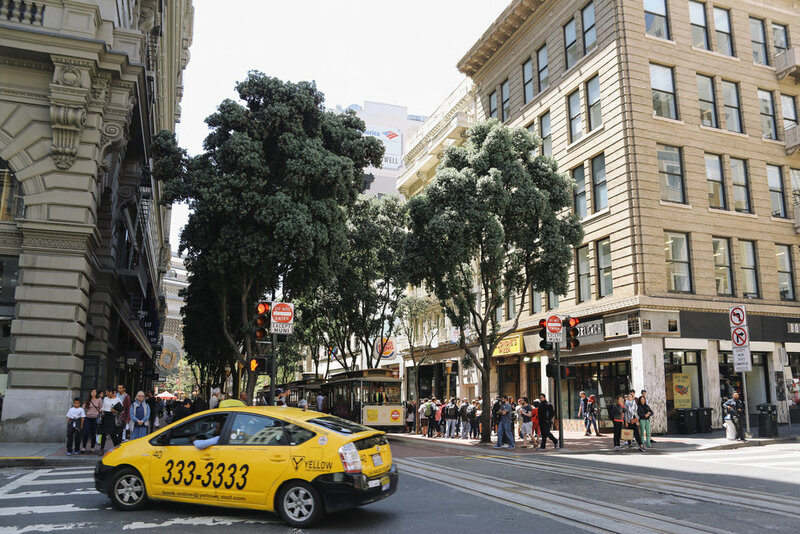 Wherever it's located, you can take a taxi or an Uber into the city for your adventures and then use the cable car system to get around throughout the day. We loved our quick day adventure in San Fran and would go back in a heartbeat. It's the beautiful people, variety of cultures, Hollywood features that you pass by easily on the streets and tons of fun that make this place so special. After doing lots of traveling, on the road and in the air, I decided to share some of my "hacks" and products that I don't travel without. 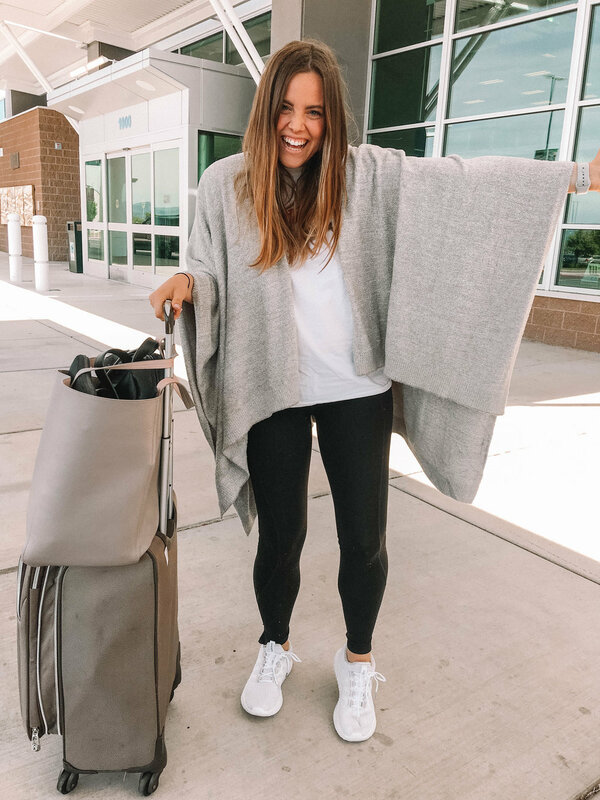 People always make the biggest deal about what they wear on the airplane, making sure they have on a comfy shirt, comfy bottoms, shoes that are easy to take off in the security line if necessary. But, comfort goes further than what you're wearing. Your travel experience doesn't have to be miserable, but it could take a turn for the worst if you're not prepared. Here are a few things that I find to be high priorities when traveling. I've been there. Quite humiliating to say the least. I always travel with my leather carry on because it's sturdy and I can pack it to it's fullest while I'm on the run. I love traveling with a backpack because it's easy to transport since you're not necessarily carrying it. The worst is when your flight gets cancelled or delayed and there's a long layover you didn't prepare for. How could you since you had to put all of your liquids in your checked luggage?? There are carry-on sized travel tubes that you can put just the right amount of shampoo, soap and lotion for awful situations like these. I always have a few of these stashed just in case, but fingers crossed and lots of prayers they don't have to be used. Airports are ew. All the people, all the germs. I'm not a germaphobe but you have to be crazy to walk around an airport for a few hours and think you won't be affected. I'm also not a huge fan of public restroom soap (always feels weird to me) and hand sanitizer (sometimes it makes my hands react and the smell gives me headaches) but alllll the praise hands because I found a hand sanitizer spray in the scent "lavender" and it's made without harsh chemicals. Gotta have the drivers license or ID, passport and boarding pass out ready to be checked. Oh! While you're juggling your carry on in one hand, your phone in the other. I snagged a passport holder from Anthropologie that has come in handy when traveling (international or domestic) because of it's storage for my ID and passes ready to access! When I fly, for some reason, I can turn my music all the way up on my phone but still feel like I'm listening to the engine of the plane. Plus, if my earphones are in too long, my inner ear starts to ache (another quirk, what's new?). I love over-the-ear ear phones because they block all the noises, give greater sound quality and also don't hurt me during my trip. A good book that I can't put down is key to a long drive or flight. Thomas and I love to drive and read together. It makes the trip pass by so much quicker. It's always interesting too because books can be great conversation starters. You can tell a lot about a person based on the book that they're reading. I normally always try to find an uplifting book in hopes that someone would ask a question leading to really cool conversation. That airplane air, my lips hate it. I always get off the plane peeling skin off of my lips. (Ew, gross, I know). I love this lip balm because 1. it's flavored with peppermint and 2. It's easy to apply and not sticky like some chapsticks. It balances my lips when they need balancing most. The airplane air isn't only terrible to my lips but my face as well. I feel dried out, broken out and downright dirty after I get off of my flights. This rose water spray is a great refresher, I also use it as setting spray and it brings a healthy glow back to your skin to make you look more lively instead of traveled. These just make my trip so much more comfortale and enjoyable. I hate not being able to think about my destination becuase my journey is so miserable. It's been about a week since one of Thomas and I's greatest getaway and I can't wait to share all of the details and pictures we were able to capture on our trip! We arrived on Monday evening and checked into our inn in Sonoma Valley, got dolled up and headed out to our dinner to celebrate our first wedding anniversary together. We chose to eat at a quaint and intimate restaurant that sits in the hidden corners of Saint Helena (a small neighborhood that sits in Napa Valley) called Cindy's Backstreet Kitchen. It's the sweetest place with the kindest servers. When Thomas made the reservation, he snuck in the small detail that we were celebrating something special and when we arrived and were seated at our table, they brought us complementary glasses of champagne to start the evening. How thoughtful! It's not just the menu that takes your breath away - we'll get there - but the interior decor as well (the wallpaper is so perfect!). I didn't grow up in a meatloaf loving family but thanks to Thomas, he's turned my tastebuds towards loving it. Cindy's had the most flavorful meatloaf I have ever eaten, Thomas admitted it was his favorite too. To top the evening off, we had their Campfire Pie (s'mores pie) with a marshmallow top that's torched to perfection. It's big enough to split, for sure. Because of the crunch we were in, we ate flaky, warm chocolate croissants and ham + cheese breakfast sandwiches and a dark chocolate and cherry muffin from Bouchon Bakery. Again, another aesthetically pleasing place with the greatest goodies. They have a large selection of macaroons, and all baked goods. They don't have seating inside the bakery but there's outdoor seating right outside so we highly suggest this for a morning that has perfect weather and little rain. Bouchon Bakery sits in the sweet neighborhood of Yountville. If you're not in a hurry to get anywehre that morning, take some time to roam around this sweet town that holds so many Michelin-rated restaurants as well as great boutiques. Like I said, Yountville is so stunning, it deserves more time than what we had leftover after Bouchon so we continued on our way to the Napa Valley Wine Train Station. 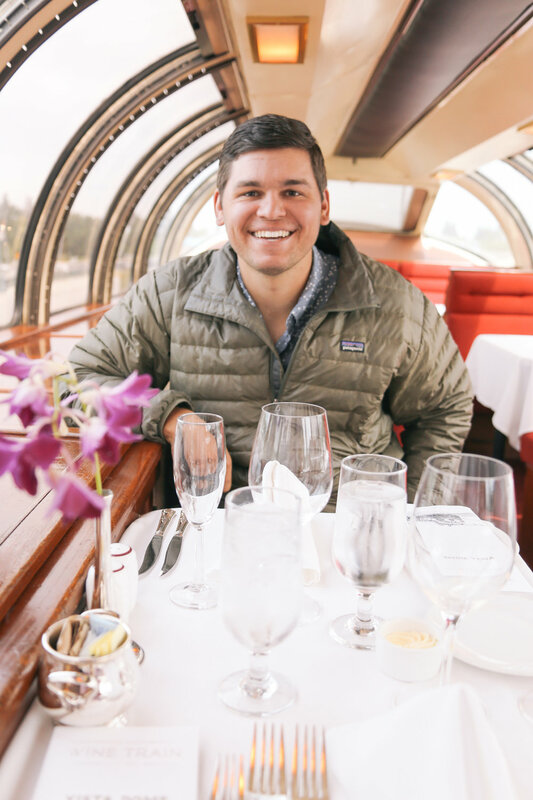 Thomas had reserved us a train ride through the valley, passing all of the vineyards with a four-course lunch with a fabulous wine selection. We sat in the Vista Dome, seated higher than the other cars, which gives you a glass roof view of the entire valley. It is so so worth the extra few dollars to grab a prime seat like the ones in the Vista Dome. The lunch selection is more delicious than you can ever imagine. To be completely honest, Thomas and I had expected a meal that is mass produced for everyone on the train. However, the Vista Dome received an exclusive menu that was only made for the few people sitting in this section of the train. There was a first and second course followed by an entree and dessert. Each course also had wine pairings from vineyards and wineries in the valley. Throughout the train ride, you're brought your courses by an incredible server with the greatest waiting service. We chose the Ambassador train tour which takes you to two vineyards after the train ride: Charles Krug Winery and Raymond Vineyards. Charles Krug was the most "traditional" styled winery that we visited our entire trip. I loved it for its green gardens, carriage house exterior, and Tuscan feel. You're immediately transported to a vineyard in the outskirts of Italy. When we arrived, we were poured a tasting of their house made Pinot Grigio, which was refreshing on this sunny day. They take you through a guided tour inside of the fermentation process, the certain rooms that act as venues to wedding ceremonies and then you end up at the last tasting room that holds a "museum like" feel to get the historic background of the vineyard and Charles Krug. Thomas and I snuck away to visit the carriage house a little more up close than the far away look we got from the gardens - so worth it! We were then taken to our second vineyard spot on the tour, Raymond Vineyards which has a fun vibe, less traditional more modern. There were purple and pink lights glowing in most of the rooms. This is a well-known place for celebrities to host their most extravagant parties. Before you're taken inside, though, they let you wander through their farms and gardens which is a super fun part that we thoroughly enjoyed. 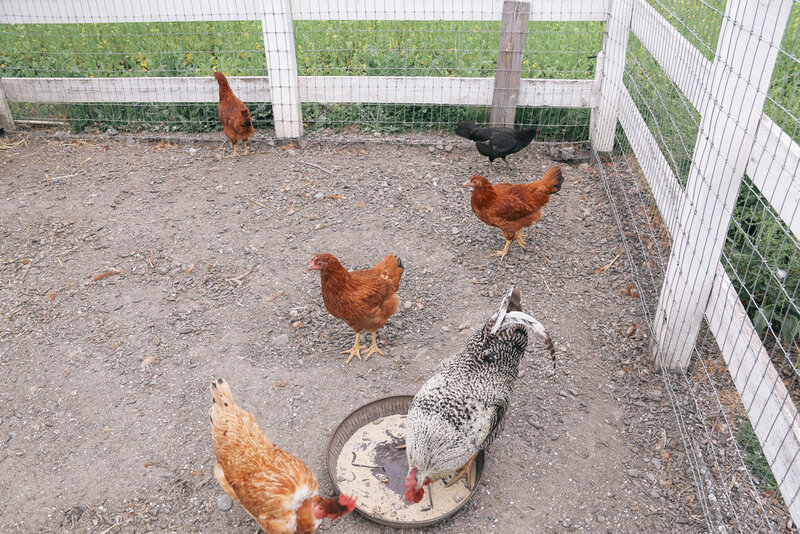 We got to feed the goats, see the chickens and get the beautiful view of the vineyards from afar. After all of the vineyard tours, we needed a little bite to eat so we headed into the town of Napa to explore and snack a little. We wandered around to find a super cute market, a great boutique called Hunter and Gatherer and finished up the evening snacking on Redd Wood's well known flatbread pizzas and appetizers and unique bar concoctions. Yum! Highly suggest their procsuitto pizza. We wanted to end our evening early because of the big adventure that was waiting for us the next morning: a sunrise hot air balloon ride. This has been on our bucket list for a while so we were so so thrilled to be able to mark it off while being in the famous Napa Valley with Napa Valley Aloft. 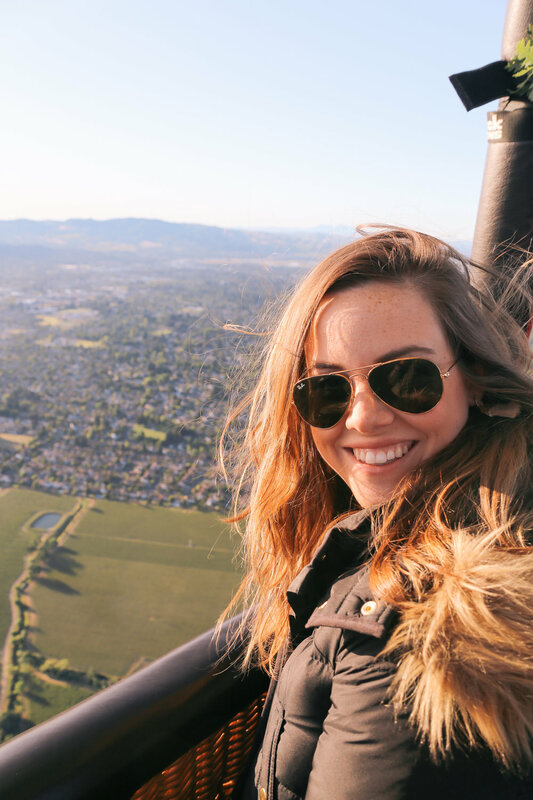 Thomas and I have gone skydiving before, and other adrenaline filled adventures, so we were nervous to know that this hot air balloon ride is more peaceful than eventful. And although it was, it was a memory we'd never forget. Hot tea, hot chocolate and coffee was served to us when we arrived early that morning. We were able to see the hot air balloons being filled up and took off shortly after. Although there's no drop or quick elevation, we were in need of a peaceful experience like this. Getting a bird's eye view while being calm is one that you'll never forget. After our ride ended, we wandered back over to the town of Saint Helena where we ate a quick bite before brunch at Model Bakery and shopped around some of their boutiques before going to Archetype for their famous brunch. This greenhouse type of restaurant, with incredible landscaping, has the most flavorful menu, so it took us a while to decide on something. I ended up with the Norwegian Eggs and Thomas with the brunch burger. Great choices! Our last vineyard experience was the greatest to end on: Sterling Vineyards. First and foremost, you have to take a gondola ride to get up to the actual quarters. We paid extra for the "Silver Experience" and we can't recommend it enough. You're swept away to a balcony/terrance view of the property while given three tasting paired with local cheeses, meats, fruits and nuts. After this experience, you're on a self-guided tour, at your own place, for the rest of the tour. The last tasting ends on the rooftop terrace with a spectacular view. It offers tables and chairs and outdoor seating with umbrellas to relax and take everything in before the gondola ride back down to the Valley. 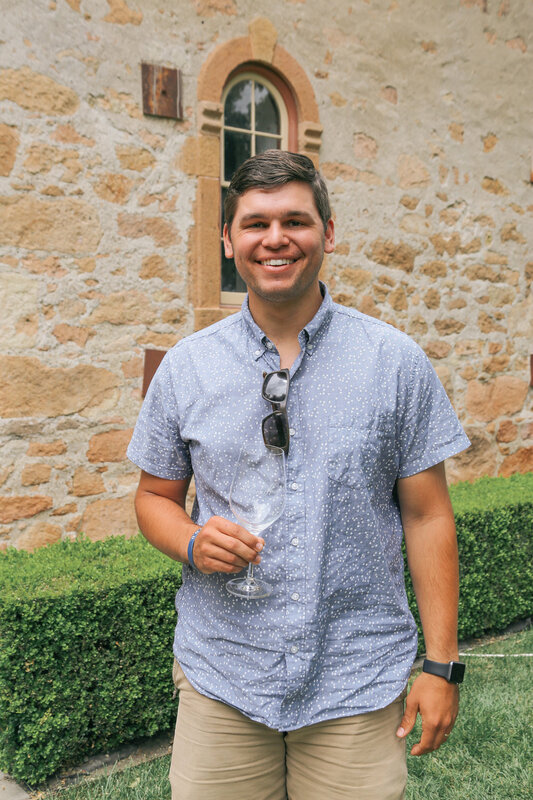 Thomas and I are so so thankful that we got this sweet time to take in another great part of our country, to roam through vineyards, to learn new processes and to have an "adventure" that also offered more rest than we ever knew existed. Napa, we will see you again very soon. I expected the Grand Canyon to make me feel so small, so insignificant, so microscopic compared to this Canyon, itself. In reality, I felt strong, valuable and significant when this thought overwhelmed me: even after all of this was created, God didn't see the Earth "complete" or "beautiful enough" without me + you. My God isn't the kind that would create something to make me feel small and insignificant. He made it to give us strength, to be empowered and to remind us we weren't made to climb mountains but to move them. I made this video as a reflection and reminder for y'all (and myself) that I was created to be far bigger and more loved than these incredible mountains were. We went to Waco, TX because it was on the way to our destination out West: California. We took little detour off of our route but we were oh so thankful. You may have heard about Magnolia Market, the bakery and Silos because of the HGTV show, "Fixer Upper" with Chip and Joanna Gaines but I fan-girl'ed and begged Thomas to take me. He loves me so much so we ended up starting our road trip at the greatest store on the planet, if you ask me. If you're planning on going, I suggest going in the morning time or heading over on a weekday (we went on a Saturday). Because we got there so early, we were able to find a parallel parking spot right on the side of the road. If you get there later, there are tons of spots in local churches parking lots for $10 a spot. The great part of being there so early is that we were able to get in line for the store and head right on in. Usually, you wait in line for a while until a few people exit and then they let a few people in. I was not about that so we were there at opening. The store was much more than I had imagined! There was a section for everything: kitchen, home decor, bedding, candles and scents, greenery, Chip's corner with all the manly stuff, kids decor and then rugs + wall decor. Although there was some kind of organization to it, it was still overwhelming - in a good way. They have fake flowers that look real as every so you can put together a bouquet and take it home to remember your trip forever. The staff is so nice, excellent and polite so you'll never feel un-welcomed. If you're traveling, like us, they have an option to ship your item but we were suggested to try and stuff them in our car (so we did). Otherwise, we would have had to pay a large shipping and boxing fee - at that point you might as well just shop online. As soon as you check out, there's a turf lawn outside with outdoor games and seating to rest your feet or grab a meal from the food trucks that surround the lawn. Dogs are welcome! Hallelujah because Remi had to stretch his legs just as badly as we did! He loved the smell of the food trucks, especially their kettle corn. There's plenty to chose from, the bakery truck, BBQ truck, hot dog truck, pop corn stand, plenty of local Waco business to propel and support. There's a greenhouse with a beautiful garden right outside to walk through and you can hit up the "Seed and Supply" right after if you want to stock up on your gardening supplies. Make sure to take a look at the Silos and the bakery. The bakery will also have a long line, so anticipate that but apparently it's worth it. With the timeline we were on for our road trip we didn't have time to stand in the line but we smelt it walking by! They hand out cards with the different cupcakes and cookies they have that day so that you can chose which one you'd like best before you get in the bakery - it makes the line move quickly. You can get your goodies to-go or you can eat it outside in the beautiful patio they set up for customers. Every detail is excellent and I think that's exactly how Chip and Jo wanted it. We so so enjoyed our trip and think everyone should make an effort to experience the Magnolia Market. Who's down for a road trip? You may have seen it on Instagram and Facebook but we completed a road trip from Birmingham, Alabama to Etna, California and y'all, it was a blast! I highly recommend taking a few days to travel across the country and see our America - it's remarkable! Our drive from Birmingham to Waco included us going through Alabama, Mississippi, Louisiana to finally Texas. 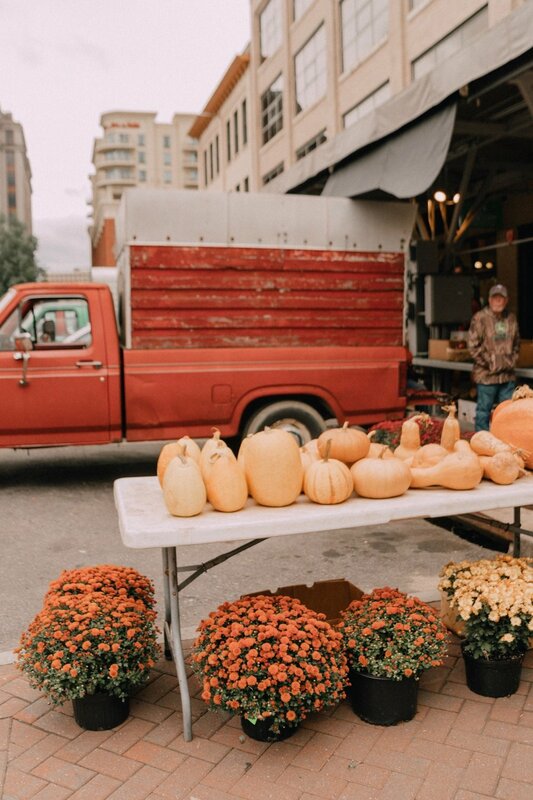 We stayed right outside of Waco that night and got up the next morning to head to Magnolia Market (the famous store of Chip and Joanna Gaines from HGTV's "Fixer Upper"). The entire trip we stayed in hotels that we found along our way that were dog friendly because we brought Remi the whole way. We got up the next morning and headed over to Magnolia Market and gosh, this was a sight to see! If you're planning on going, I suggest going in the morning time or heading over on a weekday (we went on a Saturday). Because we got there so early, we were able to find a parallel parking spot right on the side of the road. If you get there later in the day, there are tons of spots in local church's parking lots for $10 a spot. The great part of being there so early is that we were able to get in line for the store and head right on in. Usually, you wait in line for a while until a few people exit and then they let a few people in. I was not about that so we were there at opening time! Read about our Magnolia trip here! After Magnolia we headed West to Albuquerque, NM where we were met along the way by sweet Texan towns and lonely roads. We loved it though, the windmills, the lack of road signs, the two lane highway and Ranch signs on the left and right. We stopped for a Mexican lunch in Hico, TX in a small town that had a market going on as well. We window shopped and went inside a sweet home decor boutique called, "Hill Country Dwelling" where I couldn't walk out without a coffee table book and other fun knick knacks for our new cottage-home in California. We got to Albuquerque later than we had expected so we headed to bed to prepare for our long day at the Grand Canyon. The drive from Albuquerque to the Grand Canyon was stellar! The difference between the desert view to the mountainous view was incredible. We drove up the windy road to the entrance to the National Park and headed right in. We parked at the South Rim of the Grand Canyon where you can find the most spectacular view! There's even a short passage way where you can skip around the fence and see the Grand Canyon from a "less tourist-y" view by standing on a rock that overlooks the Canyon. Dangerous but worth it. After we saw the Grand Canyon and a lot of what it had to offer, we came down the mountain and grabbed a bite to eat at a local pizza shop. After diner we kept driving to Kingman, AZ and spent the night there. What a drive! It took forever because we didn't exactly account for the LA traffic. Yikes! So we stopped in the famous Coachella Valley, CA for a short pit stop, to pretend like we actually went to "Coachella" and to play fetch with Remi. Once we finally got into LA, we stopped at the sweetest place for donuts and most of their selection was gluten free/vegan so our tummies thanked us after all the to-go food we had been eating. We walked down the street, a little outside of Beverly Hills, and took Remi into Vanderpump Dogs and got to see their store! They had a great grooming section, retail section and other dog treats available for Remi. We hopped back in the car and drove down Sunset Blvd, onto Rodeo Drive. We got out, walked around, saw all the stores and went back in the car to chase down the Hollywood Sign at sunset. After seeing everything that we could fit in the few short hours we had in LA, we grabbed sushi at this awesome sushi bar called Blue C Sushi. There was a conveyer belt that went around the entire restaurant that had different types of sushis and appetizers. The plates were labeled with different colors and each colors indicated a price. You'd grab a plate off the belt and share it and then stack your plates. Your bill was based on the colors and amounts of plates on the table after you were finished. It was the perfect, unique LA dinner experience we were aiming for! Must go to Blue C Sushi, right outside of Beverly Hills in Hollywood. That day we drove to Yosemite National Park which is a sight to see! It's not like the Grand Canyon where you drive up, park and walk up to the view. At Yosemite, there's plenty to see, different views and different things to do besides walk around. We stopped at two different views along our drive through. Our favorite viewing spot in the pictures below was at Tunnel View on the South Entrance of Yosemite. We got out, took a few pictures, climbed some rocks and then headed out of the park to make good timing to JH Ranch. We stopped and visited a friend in Chico, CA before finding out Remi had eaten a pack of gum and destroyed a water bottle in our car. We called the vet, everything was fine! Praise! But, we hurried to the Ranch and finally were able to lay our head on the pillow in the place we'll call "home" until September. I stumbled upon Revelator in Mountain Brook Alabama. One of the first few days in the area, I looked around for what would be my coffee shop. I was secretly interviewing the baristas and I felt like I was dating the menu's until I found "the one." It wasn't long until this small cute shop became my "one" before I was even able to go anywhere else. A plushy West Elm rug greets you with sleek white walls and funky wooden chairs. A few tables decorated with coffee rings and succulents invite you to sit. The menu is small and mighty offering plenty of options to add to your simple coffee: cinnamon honey is my friend's favorite. Close to the Alabama Theater, you're in a more industrial environment greeted by, instead of a rug, a standing lamp with a large pine meeting table and the coffee bar. We grabbed a seat next to the window with a view of the latest construction development in the middle of the road. The Revelator baristas brought us over their newest creation to try: mint black tea with a splash of almond milk. The chairs are comfy and big, the tables are sturdy and their wifi is free. BINGO. To be honest, the real reason we swung by Nashville in the first place was to pick up a washer/dryer set that we bought #adulting. But thanks to that, we were able to spend the day walking up and down the streets of The Gulch and 12 South in Nashville, TN. If you've never been, you're missing out -- incredibly. If you have, you'll probably read this and the whole time be nodding your head and saying "yes!" Here's a look at our itinerary and the places we found along the way. On our way into the 12 South neighborhood, we stopped in the Gulch to grab some Biscuit Love coffee to-go. I'm convinced they have the best brew. I grabbed a chai and Thomas got his regular order, iced coffee. We ended up parking at the very end of the 12 South strip so we could walk all the way from Jeni's ice cream all the way down to the White Mercantile and we didn't miss a thing. The sweetest flower truck that parks in different corners around Nashville carries the greatest selection of flowers to create the bouquet of your dreams. It was just my luck and I was able to put together a Vday bouquet with the help of Thomas. Lots of carnations, eucalyptus and other beautiful flowers. Praise! A super cute and funky place to just walk around and enjoy all the beautiful knick-knacky things. They have beautiful bar cart stocking items, coffee table books, things for your office that are rather odd and lovely. Not to mention, the music you're shopping to is always on point and the manager could easily become one of my best friends. If you love antiques, the farmhouse look or anything that has to do with rustic contemporary, be sure to stop by. The White Mercantile has antiques and odd-ends in one room and the other has everything from women and mens clothing to toys to really great socks and journals and thing to make your pet super happy. This store, owned by Reese Witherspoon, is a great fun shop if you love being identified as a "southern belle." Almost every clothing piece has the word "y'all" incorporated, they offered Thomas some sweet tea and they have the cutest nooks full of classic southern decor. I can't rave about this place enough. 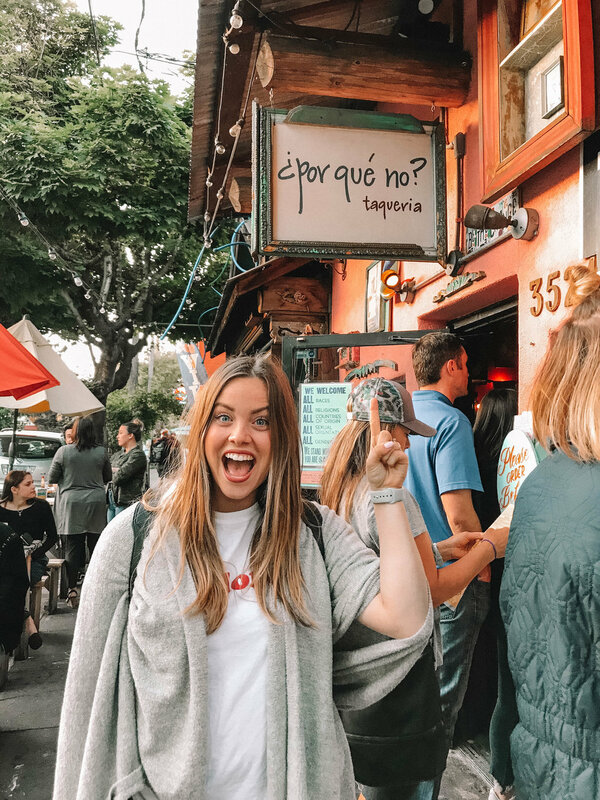 If you want authentic Mexican food with a great atmosphere, personal servers and want to sip on a margarita while you're at it, Bartaco is your place. They make their tequila in house so you can imagine how magical their margaritas are. Their menu is sushi-style meaning that you order at your own convince and fill out a paper with how many of what tacos you want and they come by, pick it up and your tacos come out in no time. We, however, ordered the large tray with 9 tacos and 3 sides and 2 tamales. It was the perfect amount for the two of us since we've been walking around all day until then. Greatest news - if you eat outside, they're dog friendly. So, Remi got to join us and eat his dinner right next to us. The pink neon lights, the white subway tile, the lines and lines and options of donuts, it's truly magical. I love Five Daughters because of their tiramisu and maple bacon donuts. They're filled with a buttery cream (I normally don't like cream filled donuts) so the donuts are well worth the four dollars. Must go. If you don't have time to go in, no problem! You can order them and pick them up to-go! You know the places where you go to rest? To defeat the hustle and bustle throughout the day? The replenish and rejuvenate? Real and Rosemary has become one of those sacred safe places for me and I just had to share. Real and Rosemary is a quaint eatery tucked away in Homewood, Alabama. It offers a "real" and fresh menu with organic and yummy touches. There's rustic table with minimalist decor finished with a clean, pastel pallet. There's a bar for a night scene to end any great date with conversation that's not competing with the angry-loud music. It's a soft place with the kindest people in denim aprons serving you with an edgy twist. The interior is stellar but outside (if the weather permits) is my go-to. Tables on a patio with strung bistro lighting all around. A painted concrete wall adds the perfect amount of color and entertainment for your meal. The food...gosh the food. The kind where you leave feeling replenished than full, satisfied rather than sluggish. My go to is either a cup of the White Chicken Chili (without jalapeños) or the Roasted Turkey sandwich (pictured here). The sides are all wonderful: brusselsprouts, roasted carrots, sweet potato soufflé (pictured here), corn palenta cake. It's all so scrumptious. And do not leave without trying their freshly made, daily, orange blossom lemonade. It's a tangy thirst quencher with just enough pulp to know it's fresh with a tang of lemon and the sweetness of fresh orange juice and a hint of mint. Acquaint yourself with this sweet, quaint, loving place that I am proud to call a favorite. It's our first Saturday (not snowed in) in our new town, Birmingham and man! Did we enjoy getting out and exploring or what! It was a beautiful 70 degree weather day so of course we took the motorcycle and took a few (accidental or purposeful?) wrong turns. We wandered around some windy roads by Cahaba Heights, found a running trail, park, waterfront park and so much more fun! We meandered our way to a sweet nursery called "Leaf and Petal." Naturally, I fell in love with a few succulents that would go perfectly in my new gold distressed planter I picked up in Anthropologie my last visit. My brother, Hamilton, was in town staying with us and he went to grab coffee with a friend so we met him afterwards back near our home at a great burger joint: Flip. Seriously, their turkey burger with avocado and pomegranate ketchup was to die for. We chose to sit outside on the patio because, again, the weather was magical. At the Summit (a nearby shopping center) there's an overlook that looks over the mountains in the near distance. So, we were able to enjoy lunch and a view. Too bad we were too full to not enjoy their Nutella milkshake topped with marshmallows. But, we bounced across the street at Steel City Pops for our second visit of the weekend to grab a coffee and cookies + cream popsicle. It was seriously just the best lounging day. I could do this every Saturday, honestly. A "welcome" to a city has never been sweeter. Magical, indeed. We spent two days at Magic Kingdom because of it, no need to feel rushed right? The best of the best: Space Mountain, Monsters Laugh Floor, Stitch, and lots more. One time, true story, we went on Space Mountain and there was a malfunction and we were escorted off so every time I ride Space Mountain, I truly know what the inside looks like, with the lights on. However, every time I ride it is still as exhilarating! Monsters Laugh Floor is quite hilarious, and different every show! So, we went a few different times. There's a Stitch ride that I would suggest not to go on if you have a sensitive nose, like me. Let's just say there are some planned "not so pleasant smells" that aliens may introduce to the ride so I'll be avoiding this in the future. New ride alert! Man, is it fantastic! The Mine Train based off of Snow White is a new roller coaster in Magic Kingdom and we had the most incredible experience. While we were on the ride (which is partly indoors/outdoors) we got to witness the Castle's fireworks at the same time. Can you say, "wow?!" Seriously, my most favorite part of our trip. Because the show was going on and we planned to watch it the next night, we hopped back in line because it was such a short wait. Honestly, worth the wait, however long it may be. It's a Small World, eh, it's just tradition, nothin' special. Afterwards, we got some coke floats, coffee and sundaes (on Mickey) because Dane left on his "It's my birthday!' button a day late. Hehe, oops. Magic Tea Cups, go! Almost wet my pants it was so fun! We laughed so hard and were so dizzy. Avoid this if you just ate desserts, like we did. Yikes. There's a quaint lunch spot at Liberty Square that serves chicken and seafood and their upstairs is pretty much abandoned because no one knows there's even an upstairs. It's a great spot to watch the hustle and bustle of Magic Kingdom. Gotta get the Nutella and fresh fruit waffle sandwich from Sleepy Hollow. I didn't, biggest regret. Frontier Land has the best turkey legs and churros, hands down. We honestly probably rode Splash Mountain and Big Thunder Mountain Railroad probably eleven times, combined. It's just that fun. Thomas was super impressed with Splash Mountain because inside there's an incredible story with the best decor and then you get a thrill at the end. Best of all worlds. Ride Row 1 if you want to get soaked and Row 4 if you don't want to get touched with water (words from the wise). Pirates of the Caribbean is not worth the wait unless you're a serious fan. It takes you through the movie, which is pretty neat but it's pretty slow, no thrill and the animatronics aren't as impressive as others. Just sayin'. The second day we were there was Todd's birthday and the Dapper Dans sang him Happy Birthday, quintet-acapella style. I got a little lost on the second day, plus I really loved the light up balloons so sweet Thomas bought me one for everyone's sake. Also, another quick tip, get to the Castle ASAP because about 15 minutes out from the fireworks show, it's a maze and quite stressful. No one likes to be anxious at Disney, right? On Main Street, you can meet a talking Mickey (also worth the wait) at the Town Theater, there's a great candy shop that you must try the caramel apples at -- says Thomas and Hamilton -- and you have to go inside the ice-cream parlor on the corner. Across the street from the ice-cream parlor is Casey's Corner Hotdogs. I'm not a huge hot dog fan but mmm they were delicious! After the Wishes nighttime spectacular and Once Upon A Time show, the Castle shuts down for the night and there's a "goodbye message" from Mickey. You must stay till closing and see it! If you leave with the rest of the world, the monorail is packed. Honestly, the worst. But, if you get on the other monorail, that takes you to the Contemporary Resort Hotel, you can basically walk on and it takes you through a few more stops before the Ticket Station, but you'll get there before the rest of the crowd.